Developed for sensitive skin. Reduces the signs of redness, tightness and dryness. Instantly relieves the skin from unpleasant feelings of tightness. Provides intensive moisture. Helps to protect the skin from sun induced environmental influences with SPF 15. Especially mild formula is pH-neutral and free from perfume. Skin compatibility dermatologically approved. 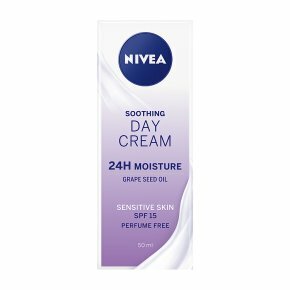 NIVEA Daily Essentials Sensitive Day Cream effectively reduces the 3 main signs of sensitive skin: 1. Redness 2. Tightness 3. Dryness.